This t-shirt is geeky and funny and that is what everyone wants from their clothing. 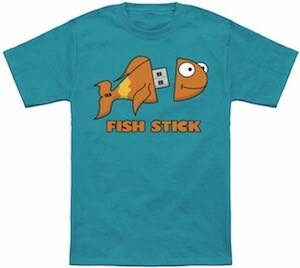 On this t-shirt, you can see a goldfish but it’s not just any fish it is a USB thumb drive as you can see as the head of the fish is taken off to show the USB connector. Below the fish it says “Fish Stick” and that is true as it is a USB stick that looks like a fish. You can get this amazing t-shirt in men and women’s styles and it comes in sizes Small – 6XL and they are made from 100% cotton.